Celebrates the central Appalachian forest — its history, culture, natural history, forest management, and products. This grassroots partnership works in West Virginia and western Maryland to explore the relationship between the Appalachian highlands forest and the people who live within it. Cacapon Institute is dedicated to using science and education to help concerned citizens protect and enjoy the Cacapon, Potomac, and other Appalachian watersheds. Through the guidance of this agency and its partnerships, resources are brought to local communities and land users to address a broad range of priority conservation issues. Unique water-wise plants for the home gardener. Healthy and hardy low-water use natives, perennials, groundcovers, and herbs delivered fresh from the greenhouse to your front door. A consortium of nonprofit organizations actively involved in supporting Morgan County, WV residents of all ages. The MCEC was formed to stimulate, promote, and develop Morgan County, WV as a sustainable and responsible community that follows “green” practices. For more information, please contact the MCEC at: mcecwv@aol.com or visit the Web site at www.ecologycoalition.org. The Morgan County Planning Commission and staff administers six ordinances along with the issuance of building permits. These ordinances are the Morgan County Subdivision Regulations, Stormwater Management Regulations, Commercial and Industrial Improvement Location Permit Ordinance, Floodplain Ordinance, Salvage Yard Regulations and the Exotic Entertainment Ordinance. The Forum advances informal education of individuals in Morgan County to apply arts, sciences and technologies in their daily lives. Focusing on Fish Kills, Intersex, Emerging Contaminants and Endocrine Disrupters. A clearinghouse of information, a “one-stop shopping” web resource where local government officials, civic leaders, and concerned citizens can access information and resources on matters relating to smart growth, sustainable development, and environmental protection. To dramatically improve the enjoyment of the rivers and streams of the Potomac watershed, we are committed to a Trash-Free Potomac by 2013! The official Website of Berkeley Springs, WV ~ The Country’s First Spa. 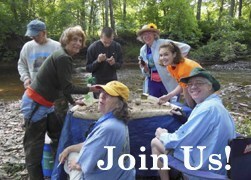 Assists corporations, communities, and organizations to enhance wildlife habitat in the Pittsburgh region. Of particular interest to our members and visitors is the Backyard Buffers page at: www.wildlifehc.org/threerivers/backyard_buffers. Up On Sleepy Creek, West Virginia Wildlife magazine, by Kieran O’Malley, Wildlife Biologist, Wildlife Resources Section, WV Division of Natural Resources. A resource to all those interested in how West Virginia is doing its part to help restore local streams and the Chesapeake Bay. This organization is dedicated to the conservation and restoration of West Virginia’s rivers and streams. Each year, citizens of the global community join in World Water Monitoring Day (WWMD), a worldwide opportunity to positively impact the health of rivers, lakes, estuaries and other water bodies. Volunteer monitoring groups, water quality agencies, students, and the general public are invited to test four key indicators of water quality: temperature, pH, dissolved oxygen, and turbidity. Among other useful resources, this site includes a Field Guild to Aquatic Invertebrates. This PDF file uses illustrations and Internet links to familiarize the user with commonly encountered families of aquatic invertebrates. The illustrations are from the the Guide to Macroinvertebrates of the Upper Midwest and are used by permission from the University of Minnesota.